First it was teacher to student, now it’s man to man. 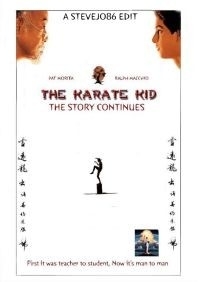 This is supposed to combine Karate Kid part 2 & Karate Kid Part 3 to one better flowing and better paced movie. My intention for this edit was to start the movie with Miyagi & Daniel going to Okinawa to deal with Miyagis father & Miyagi’s long time friendship with Sato as well as Miyagi’s backstory, but I never really like Daniels sideplot of his troubles with Sato’s student or his love interest in Komiko, to me KK2 should have been primarily about miyagi & then a new plot should have taken place for daniel once they got back to America & so that’s what I did I created an edit that focuses it’s first hour on Miyagi & Miyagi only & Daniel is the friend who comes along for support. But as this is going on John Kreese is plotting his revenge on Daniel so that when they return home to america a new set of problems arrise, however this time it’s all on Daniel. Hope that makes sense for you all. 7. More minor cuts for KK3 but nothing big as I felt that KK2 was the weak link of the franchise, not KK3.